The Gooroom from Dune looks like a giant alien soccer ball that fell to Earth without the aid of a parachute. Which is a pretty specific look, really, but I happen to like it. Especially the name, which is just fun to say. Of course the Gooroom is not actually an alien, it's an ottoman that's upholstered in poly-urethane. Size is 16" high and 22" around. Did not see a cost on the Dune site, but it's Dune, so don't expect it to be cheap. yuck. hideous. and, unlike the wonder vase, gooroom is dorkish. agreed... these look like giant latex tumors..cant even look at them!! gross!! 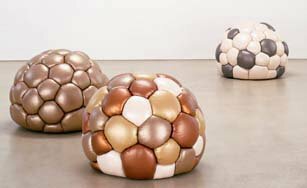 these look like giant latex tumors..cant even stand to look at them.